We get to experience some terrific hardware here at HEXUS HQ - it's a perk of the job - but after spending the past week with the Scan 3XS Gamer 1660 Ti, do you know what I like about it most? The fact that it's a system I could actually afford. Priced at £970, this unassuming rig is proof that high-quality PC gaming needn't break the bank, and it's nice to see a well-known system integrator choose to send in for review a system that's sensible rather than boastful. And don't let the price tag fool you into thinking this will be a cheap, tacky rig that cuts certain corners. On the contrary, Scan gets most of the specification right, and at this price point there isn't a great deal we'd change. Let's take a closer look, shall we? To start with, there's no reason for a PC at this end of the market to be huge. 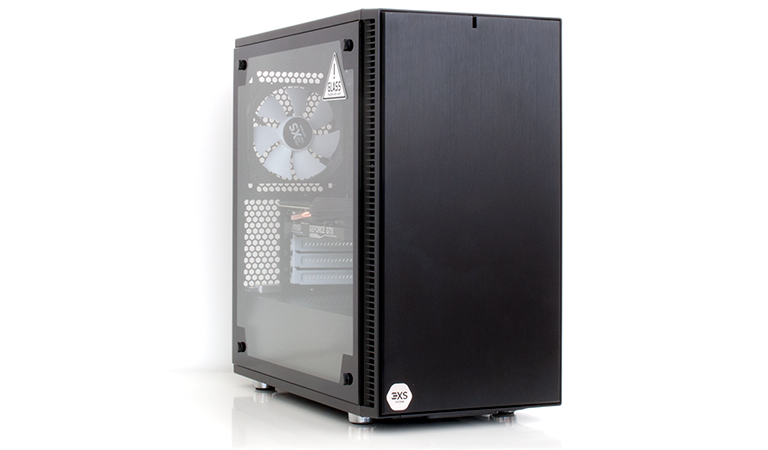 With that in mind, we like that the default chassis for the 3XS Gamer 1660 Ti is a Fractal Design Define Mini C TG. 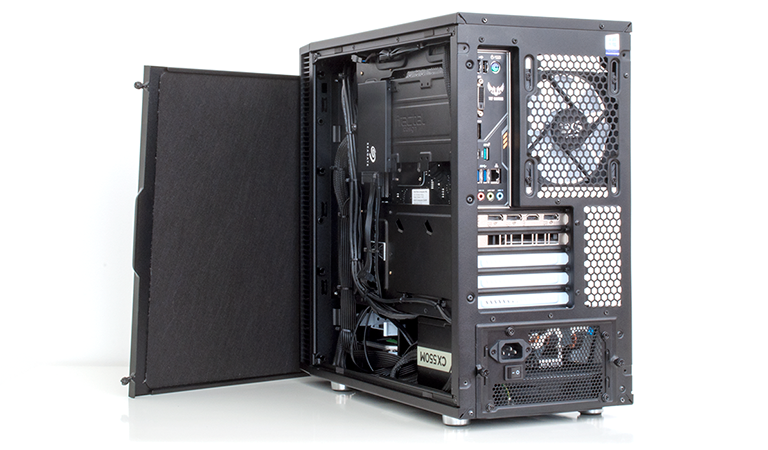 Dimensions of 399mm x 212mm x 399mm make it comfortably smaller than your regular mid-tower solution, and as you'd expect from a Define Series enclosure, the sleek aesthetic, tempered glass panel and overall build quality are all of a high standard. The £80 case is a fine base to build on, and Scan plays the value card by going with the unusual combination of AMD and Nvidia. 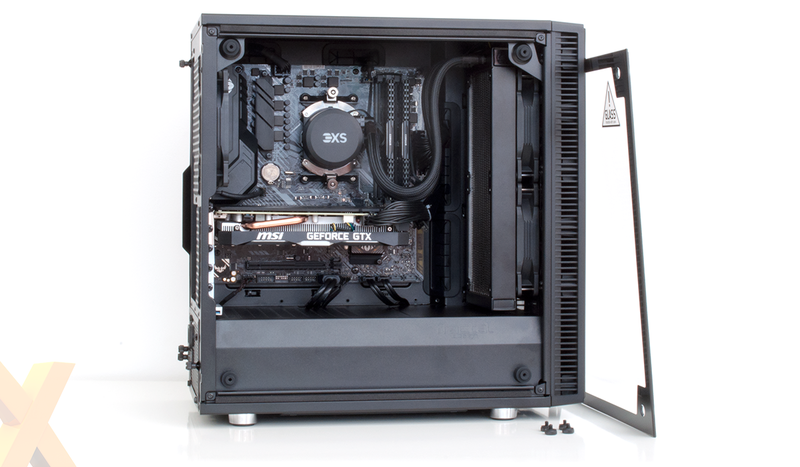 At the heart of the system, atop an Asus TUF B450M-Plus Gaming micro-ATX board, is a hexa-core Ryzen 5 2600 processor and 8GB (2x4GB) of Corsair Vengeance DDR4-3,000 memory. The faster-than-usual RAM should play to Ryzen's strengths, and in the graphics department it is no surprise to see the newly-released GeForce GTX 1660 Ti step in for gaming duties. There's no Founders Edition, remember, so for this particular build Scan has opted for an MSI Ventus XS OC that comes factory overclocked to 1,830MHz. A fine mix, in our estimation, and the supporting cast is perfectly decent, too. The primary storage device is a 500GB Seagate BarraCuda 2.5in SSD, a 1TB Seagate Barracuda 3.5in HDD serves as a spare repository, and a semi-modular Corsair CX550M power supply keeps everything fed. We'd normally expect to see an air cooler in a build of this type, but Scan reckons it can offer its custom-branded Hydro cooler at little extra cost to the user, and we're not complaining as the 240 rad keeps the chip running extremely cool at all times. It looks rather nice, too, freeing up space around the socket and filling the void that would otherwise exist at the front of the chassis. And that, in a nutshell, is your lot. There doesn't appear to be a great deal to brag about at first glance, but for under a grand the 3XS Gamer 1660 Ti offers a six-core, 12-thread CPU, liquid cooling, fast DDR4 memory, solid-state storage, and a graphics card that can handle modern titles at either FHD or QHD resolutions. Sensible choices all round. It is interesting to note that in our discussions with Scan's 3XS team, they admitted to finding it more challenging to put together a well-rounded spec at this price point. Mega rigs costing thousands of pounds are easy - simply take the best of everything - whereas trying to land at under £1,000 requires thoughtful consideration. Has the Scan team got everything right? That's going to depend on the end-user, and for me personally I can think of only one or two small tweaks I'd be inclined to make. I'm not sure I'd use the secondary hard disk at all, so there's a temptation to jettison that, perhaps in favour of more memory (2x8GB), and given that the system is small enough to be moved around with relative ease, I'd be inclined to add a WiFi adapter to make light work of getting online. These are upgrades we expect will be available via Scan's online configurator. Could you put the same system together for less if you know what you're doing? Sure, but having shopped around for the best prices on these components, we reckon the saving would be somewhere in the region of £30-£40. Hardly worth the effort, as with the Scan 3XS you get a tidy build, a clean install of Windows 10, a goodie bag containing a mouse mat, Scan Computers mug plus a couple of cable tidies, and of course a three-year warranty from a reputable UK retail. This includes 12 months of on-site cover, plus parts and labour for the full 36 months. Enough of the chit-chat, who wants to see AMD and Nvidia working in harmony for our benchmarks?